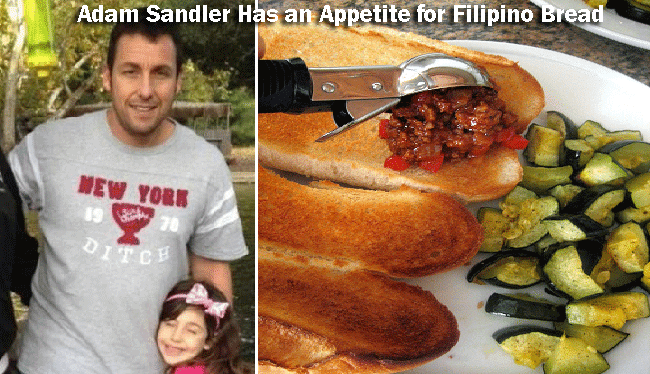 Hollywood, California - It is good to know that there are Hollywood stars who appreciate Filipino foods and one of them is the “Wedding Singer” and “50 First Dates” star Adam Sandler. It was reported that he was addicted with Filipino bread. Adam learned about the so-called Filipino bread from the Filipino mother of his friend Rob Schneider who is also an actor. Adam shares his story of addiction way back in Hawaii to the mainland of America wherein he enjoyed a lot what Rob’s mother was baking. This has urged Adam to go to the Filipino bakery every morning. Adam really patronizes Filipino bread. Drew Barrymore is Adam Sandler’s onscreen partner for 16 years. Both of them are parents now and they give compliment on each other when it comes to parenting, in fact, Drew said that Adam is such a good father. They have a new movie together entitled “Blended” which will be shown in the Philippine cinema on June 11. The two have been famous for “The Wedding Singer” and they have been together in so many movies. Whenever they are together, they throw jokes on each other and it seems like they are good friends. Adam Drew appreciates her few Filipino friends in relation to the Filipino bread issue. With Adam’s addiction to Filipino bread, what could be his face’s expression while eating the famous “pandesal?” Anyways, if you are a Sandler – Barrymore tandem fan, you should watch “Blended.” This two are still strong being together onscreen for so many years.